Piyush Pandey is executive chairman and creative director for Ogilvy and Mather, South Asia. He worked as a tea taster before joining Ogilvy in 1982. He is passionate about cricket and has played in the Ranji Trophy. Santosh Desai is managing director and chief executive for Future Brands. Desai is interested in studying the relationship between culture and brands. His first book on contemporary India is due to be published early next year. Kiran Khalap is the co-founder of Chlorophyll Brand and Communications Consultancy Pvt. Ltd. Starting out as a schoolteacher, Khalap moved to advertising in 1983, working with agencies before setting up India’s first brand consultancy. Lloyd Mathias is president and chief marketing officer of Tata Teleservices Ltd. Prior to this, he was a senior director for Motorola’s South-West Asia region and was executive vice-president of marketing at PepsiCo South Asia. Right from their network advertisements about the little boy and his pug to the hugely popular Zoozoos, the campaign transformed the category with its simplicity and consistency. “I don’t know any other brand in advertising which has managed to maintain its brand voice through four name changes and people haven’t abandoned the brand," says Kiran Khalap. 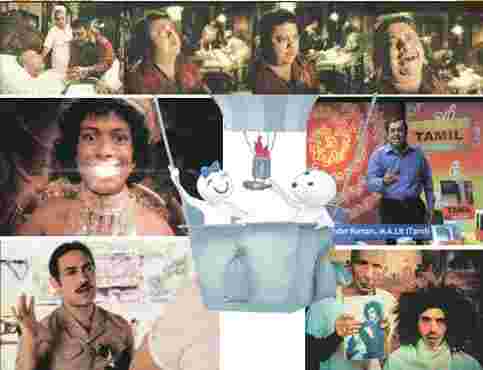 Ads up: (clockwise from centre) Vodafone’s Zoozoos; Aamir Khan in Coca-Cola’s Paanch! campaign; ads for Happydent; M-Seal; Bingo and Center Shock. Shot by film-maker Ram Madhvani, the advertisement shows a smile can literally light up a room. The panel felt the ad demonstrated that the idea-execution divide was a tenuous one. “The number of layers seamlessly stitched together to produce a spectacle of a scale that is truly of a different league... I would say it’s a triumph of the craft," says Santosh Desai. In a category of fantastically made demo advertisements with images of, among others, two trucks stuck together and a man stuck to the ceiling, the Fevicol advertisements built the concept of adhesives to represent strong human bonds and relationships. A man enters a local barber’s shop and asks for an Afro hairdo, only to have a Center Shock chewing gum stuffed into his mouth. “It brings that whole brand experience alive," says Lloyd Mathias. “That burst of flavour…it’s a great visual depiction." A comment on corruption in society, the advertisement traces the path of a file in a government office. Set against the commentary of a hockey match, the file reaches its destination, and the bribe is in the official’s pocket even as a goal is scored in the match. “At a subliminal level, you don’t associate India winning with hockey, therefore this file passing is not about winning, but about eventually losing to corruption," says Khalap. The advertisements show actor Aamir Khan in various roles, including one as a safari-suited, paan-chewing official who pulls up a village storekeeper for charging more than Rs5 for a small bottle of Coke. The campaign marked a huge change in Coke’s fortunes in India. For the first time, the brand had shed its foreign tone and was speaking to the masses. In the original script Piyush Pandey wrote for the brand of putty, the drop of water falls on the old man’s signature. But he changed it after his nephew Abhijit Awasthi, executive creative director, O&M, South Asia said, “He’s adding the zeros to that number, drop it on the one." Khalap says the ad is memorable as “it’s an incredibly original thought, beautifully executed along with brilliant delivery of the punch line". The launch campaign was extremely funny and has seemingly idiotic advertisements such as the Glad Bangles one, in which a Russian model exalts the benefits of crystal bangles, which have nothing to do with the product, Mad Angles. “The sense of humour is such that it’s not universal, and yet it strikes an absurd chord. Everyone will have their own favourite Bingo ad," says Mathias. The commercial influenced not just advertising within the paints category, but other categories as well. The most recent advertisement for Tata Walky phones has the same imagery. “Unlike most ads which had a structure—a beginning, middle and end—this had none. Yet, you couldn’t keep your eyes off it," says Khalap. Balbir Pasha Ko AIDS Hoga Kya? The advertisements showed people talking about a fictional character, Balbir Pasha, and his chances of contracting AIDS. The advertisements were meant to correct misconceptions about the disease and get people talking about it more openly, which it did. “It was an advertising solution, rather than an execution," said Desai. “In terms of the depth, newness and scale of problem it was trying to address, I think it had a strong impact." Could you show us to our stable, please?" asked Piyush Pandey as the rest of the party broke into raucous laughter. It was a reunion of sorts as our panel shook hands and spoke animatedly at Tote on the Turf, near the stables of the Mahalaxmi Racecourse in Mumbai. Our hopes of a spirited afternoon, punctuated with heavy betting and edible missiles being thrown, melted away as our panel of advertising and marketing professionals cordially exchanged notes on their 10 best advertisement films of the decade. Warming up over an assortment of cappuccinos, green tea and vodka tonic, we had the first tally: five out of 10 on each list matched. They unanimously voted for the Orange-Hutch-Vodafone campaign. Not only was the brand applauded for changing a category known to be fraught with “technical gobbledygook" but also for maintaining a consistent tone across changes in identity. Fevicol came a close second, and the award-winning palace advertisement for Happydent chewing gum was next. “While people argue that the concept of teeth emitting light has been used before, this commercial goes way beyond that. So much so, that you forget the past. That to me is the magic of execution," said Pandey. They also picked Center Shock chewing gum’s “barber" advertisement for its absurdity. The discussion progressed smoothly till they came up against two Times of India campaigns—the “Pakya" commercial, where an old man celebrates the triumph of his grandson, and the “pushing files" commercial, which was a comment on corruption. While Lloyd Mathias voted in favour of “Pakya", claiming it touched an emotional chord, Santosh Desai though it was too contrived. The group didn’t consider the latest award-winning Naka Muka commercial, as they thought the concept had been done before. Pandey thought it had done beautifully at award shows because it had the whole “Slumdog Millionaire" appeal. Coca-Cola’s Thanda matlab... and Paanch! advertisements were picked together as they marked a turning point for Coke. “Nothing got us scampering at Pepsi like that campaign," said Mathias, then executive vice-president of marketing at PepsiCo, South Asia. Kiran Khalap said, “Till then, Coke’s entire language was too foreign. With this campaign, they were speaking ‘Indianese’ for the first time." The group agreed on the launch campaign for Bingo, for its sheer absurdity and recall; the “dying man" commercial for M-Seal’s repair putty, for its brilliant comic timing; and Asian Paints’ Har ghar kuch kehta hai, for spawning a number of clones in the category. For the last spot on the list, Desai and Khalap picked the Balbir Pasha ko AIDS hoga kya? campaign, Mathias selected Maruti 800’s Petrol khatam hi nahin hota, while Pandey chose the SBI Life campaign. The jury, finally agreeing on the “Balbir Pasha" campaign, signed off on a high note, but with a disclaimer: “E&OE" (Errors & Omissions Expected).